Our house dates back to 1903. We've lived in it more than 17 years now, and there hasn't been a single day in which we haven't needed a new kitchen and 2 new bathrooms. We were always thwarted by some combination of the timing being bad, not knowing exactly what we wanted, and not having the money. We've reached the point where doing nothing is no longer an option. I fear that the upstairs bathroom could one day collapse and land in the kitchen. So we're biting the financial bullet and doing something that probably should have been done 17 years ago. In order to keep my sanity, I'm going to document the progress right here on this web page. You can follow along and laugh and cry with me. This is actually the kitchen after temporary cosmetic improvements. 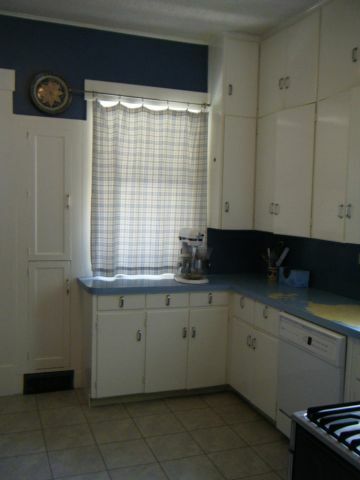 It used to have forest green wallpaper with salmon and lavender dots, butter yellow simulated leather laminate counters, and a yellow with a green tint for the cabinets. The vinyl floor tiles were loose. 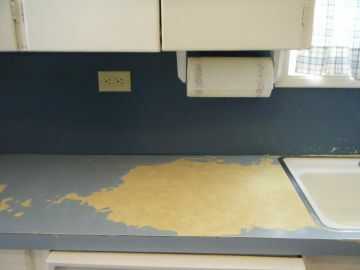 The laminate backsplash bends around a 2" jog in the wall instead of being mounted on each surfaces of the wall. 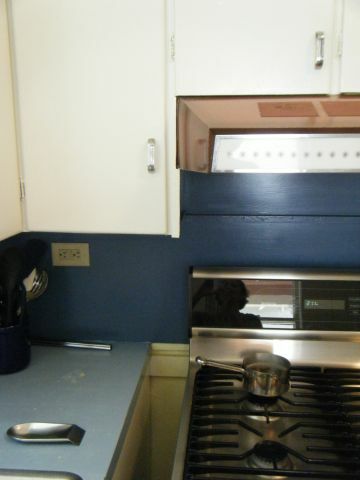 If you look closely at the picture above, the counter isn't as deep where the pot of utensils is. That's the 2" jog hiding the drain pipe from the toilet above. Don't get me started on the drain pipe. 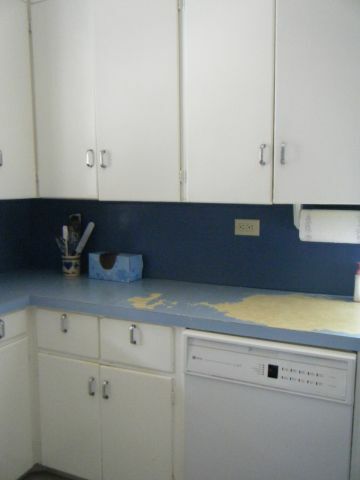 It rusted out and leaked into the cabinets. The plumber removed the wall inside the cabinet to access and repair the pipe. Now when we open the cabinet door we see the studs and the drain pipe. I painted the counters (1 coat of primer, 2 coats of a special paint, and 2 coats of clear sealer), which started bubbling after a week and peeling soon after. Don't try this at home, despite what the home improvement shows might tell you. The refrigerator and dishwasher are white. The range is black and stainless, and the range hood is brown and just blows the fumes around the room instead of venting outside. You might also notice that a lot of the doors don't close properly. No amount of planing, sanding, or rehinging is going to alter that fact. 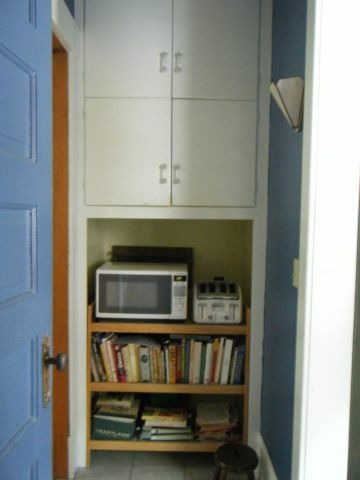 The microwave and cookbooks are on a baby changing table in a strange space under the top half of the stairs. As this space goes back several feet, we store the table leaves behind this table. There is a pot rack, but a plastic utility cart holds the overflow of pots. 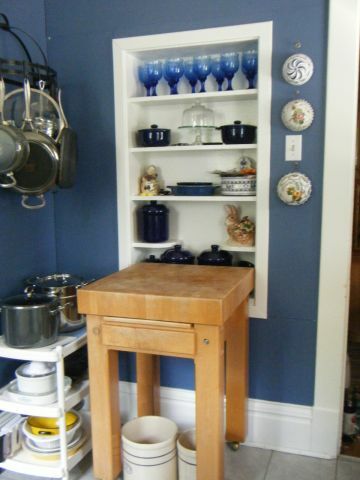 The upper cabinets are too low to accommodate the mixer, but I have to perch the mixer on the outer edge of the counter to use it because it is the only place with an electrical outlet. 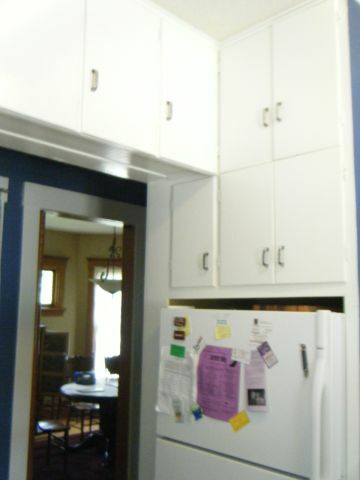 The lower cabinets are narrower than the standard cabinet width. The stove is so close to the sink that you can use the faucet's side spray to fill a pot on the stove. 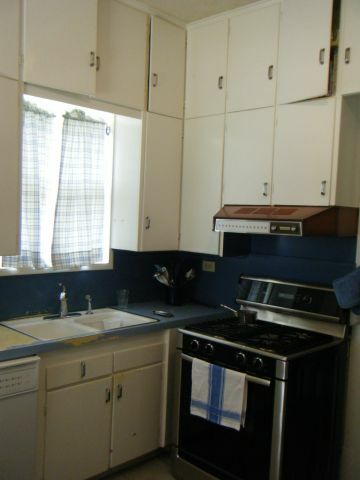 The stove is just two steps from the refrigerator. The refrigerator door blocks the doorway to the dining room when it is open. The main traffic path is next to the stove, so all pot handles must be turned inward to prevent people from walking into them. 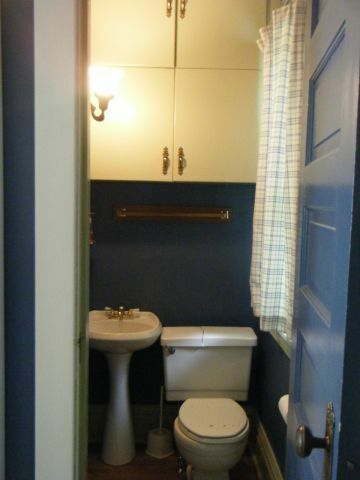 We have a half-bathroom between the kitchen and the dining room. (The stove backs up to the bathroom wall.) 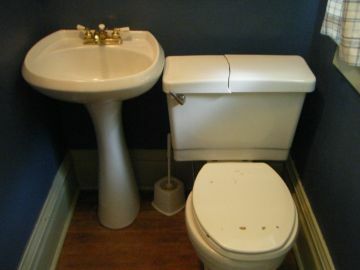 This room is so narrow that the tiny pedestal sink overlaps the toilet. Note the crack in the tank lid. I dropped the lid one of the many times when I was jiggling the float lever to shut off the water. There is no towel on the towel bar because we can't use the sink due to low water pressure. The lock on the door no longer aligns with the slot on the jamb, so we have to knock before entering the bathroom. We're used to it, but guests are sometimes alarmed. 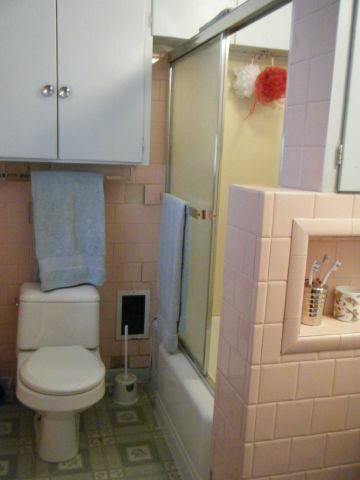 Is this the world's ugliest bathroom? You really must see this in person to get the whole effect. The floor is gray-green. The paint is blue and peeling. 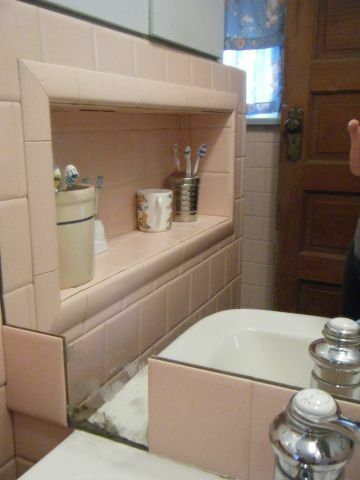 The tile is pink, speckled, and plastic. Let me repeat that: The tile is plastic. There are cupboards from the six foot level to the ceiling over the shower; you would need to put a step ladder inside the tub to reach these. Note the tiles on the mirror and the missing tile. You can't see it, but there is a plunger in the corner. It needs to be used often due to the inadequacy of the toilet. You can't see the plastic shower enclosure that won't hold caulking because the wall behind it has crumbled to sand. You can't see the miniature tub/shower with the finish pitted and worn so the iron beneath is rusting. I don't know if this is the worst part of the bathroom, but it is certainly the most unsightly. 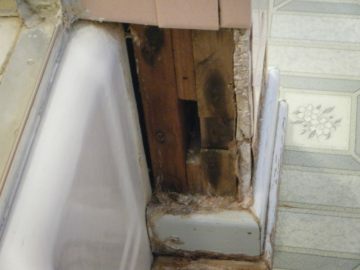 You're looking at the exposed firring strips at the base of the tub, where leaks from the tub have rotted the wood and the drywall and left nothing for the plastic tile to stick to. This is the only shower or tub in the house, so any remodeling we do has to begin with creating another bathroom. All the plumbing in the basement has to be redone so we can get full water pressure and have fully functioning drains. Click here to see the progress being made.